What’s better than the smell of freshly cooked Italian pasta? Eating it! 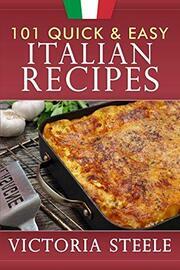 This quick and easy collection of Italian recipes contains 101 recipes ranging from simple pastas to dinner entrees that will impress and delight guests at any special event. The only thing better than the aroma of a great Italian sauce simmering on the stove is the taste when you serve it over your favorite pasta or rice. Using fresh vegetables and herbs makes your dish a healthy treat and gives you the opportunity to season it the way your family prefers. This cookbook covers a wide diversity of Italian recipes, from soups and salads, breads and pasta, sauces, pizza and calzones, and main dishes with chicken, beef, lamp, pork, seafood, meatless dishes and of course, desserts.